Monte Montgomery has taken the acoustic guitar beyond anyone's expectations. With his amazing fretwork, unique combination finger and pick style playing through trailblazing "chordal" thoroughfares often baffling even the most accomplished players. While Monte remains a huge enigma in the guitar universe, his legendary reputation has spread like wildfire since he appeared on Austin City Limits. In 2004 Monte was named on Guitar Player Magazine's list of "Top 50 Greatest Guitarists Of All Time" and in 2005 he was featured the Covers of "Frets" and "Acoustic Guitar" magazines. Countless articles have been written about Monte describing him "The Evel Knievel of Guitar", "Six Strings Attached To Dynamite", "The Answer To The Fermi Paradox" and "The Acoustic Shred Master" just to name a few. Monte's fretwork has become the benchmark for acoustic guitar players. "An American Original", there is no doubt Monte Montgomery is destined to become An American Legend. In spite of all the "six-string notoriety", and just in case you didn't "know-tice", Monte isn't just a "guitar hero", "shred master" or "guitar god" as he's most often described. No, actually Monte Montgomery is much more than just a world-class guitar virtuoso with more new tricks up his fret board than your average "guitar slinger". What sets Monte apart from all others is that he's one of the most accomplished songwriters of our time, a remarkable singer and an extraordinary music arranger. Many of Monte's fans attend his concerts simply to hear his compelling vocals as he delivers his finely penned songs powerfully and passionately. To some, his incredible guitar pyrotechnics are simply an addition of tasty icing topping off a delicious cake. Monte's latest release "Monte Montgomery At WorkPlay" (Harmonic Records - 2005), available in CD and DVD versions is a double barrel treat offering fans a visual dimension of Monte's incredible power packed live performance recorded Live at WorkPlay Theater in Birmingham, Alabama. Monte grew up immersed in music, playing professionally since his teens and is currently one of the hottest draws on the talent-packed Austin, TX music scene and throughout the U.S. where he is well known for his electrifying performances. 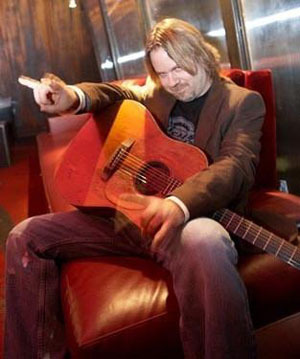 Monte was the first ever to be named by Guitar One Magazine on their list of Top 10 Best Undiscovered Guitarists in America and is the only winner of the "Best Acoustic Guitar Player" for 7 Years in a Row at the Austin Music Awards. As Acoustic Guitar Magazine notes, "Monte Montgomery is not your typical up-and-coming guitar god. His exquisitely crafted, melodically and rhythmically sophisticated pop songs suggest the best of Fleetwood Mac, Squeeze and The Police, while just happening to integrate the most mind-boggling guitar work in the state of Texas." Growing up in Birmingham, Alabama, Monte first learned piano and trumpet, and was an avid listener to pop radio. After moving to Texas at the age of 12, he joined the legendary musical scene around the restored town of Luckenbach and began his impressive rise as a musical talent. Performing with his mother at a popular Hill Country picking parlor he quickly absorbed everything he could. By his mid-teens, Monte was playing gigs on his own around Austin and San Antonio, both with bands as an electric guitarist and in a variety of acoustic configurations. During this time Monte developed his guitar chops as he absorbed the work of respected players such as Fleetwood Mac's Lindsey Buckingham, Mark Knopfler, Stevie Ray Vaughan, Albert Lee, Steve Vai, Steve Morse and Larry Carlton. "I like it all," he explains of his musical influences. Leading his own band, Monte began developing his trademark electrified acoustic guitar style. "I started playing acoustic at the beginning of each set, the response was so overwhelming that I kept the acoustic up there longer and longer. Then I just started playing all acoustic. I found I could do anything on an acoustic guitar I could do on an electric if I turned it up loud enough." After living and playing in San Antonio for a time, Monte set out to make his mark in the highly competitive Austin musical community. Starting with a $50 half-hour gig at a small Austin Pub on a Tuesday night, Monte quickly attracted packed houses and graduated to filling the biggest clubs in the city. His live performances and albums have earned him words of praise in the music press and an ever-widening touring circuit throughout the U.S. As Texas Monthly noted, "He brings taste, precision, economy and a playful sense of timing to popish songs with sturdy hooks and sings in a voice that's equal parts grit and sunshine. And when you have the ability to make one guitar sound like two, who needs any more support than bass and drums." Monte caught the ear of Austin City Limits producer Terry Lickona, who invited the relatively unknown talent to tape a segment of the legendary show. When Lickona introduced Monte to the audience, he described Monte's talent in a simple yet profound statement: "Monte Montgomery blows people away. There is no other way to describe it." When word about Monte's virtuosity reached the folks at Alvarez Guitars. They quickly took a keen interest and secured Monte's endorsement. In the meantime Monte's reputation as the Hottest Acoustic Guitarist on the planet was being cultivated as he toured nationwide. This led to the introduction of the MMY1 Monte Montgomery Signature Guitar , which was unveiled at the Winter NAMM Show in Anaheim, California in January 2004. Monte's considerable musical talents have come to fruition. As leader of his own band, he continues as a national touring act and has shown a side that's more than a new found "Texas Guitar Slinger". His electrifying live shows deliver a dynamic rock n' roll experience with rich, stunning guitar work and powerful song deliveries. Monte sings and writes songs that are concise and contemporary and although his music contains a lot of guitar it's more than just a guitar show. With an appeal that extends to listeners of all ages and tastes, Monte has been making a living playing and singing for most of his life, building a career through his own hard work and talent. In fact, it's almost as if his future as a musician was all but fated. "I never woke up and said, what am I supposed to be doing with my life? I always knew, even before I played guitar, that I was going to be doing music, one way or another."